She also issued a stark warning that demands for a second EU referendum risks shattering trust in Westminster. The Prime Minister added: “We gave people the opportunity to make a choice. They made that choice. And in a riposte to Tory MPs plotting against her leadership, Mrs May insists she plans to stay in Downing Street to deliver a programme to transform Britain long after next year’s exit date. Mrs May’s sounded her optimistic message about Brexit in an interview with the Daily Express in her private office next to the Cabinet room in Downing Street. Speaking on the eve of an EU summit in Salzburg, Austria, today that is expected to accelerate the push towards a Brexit deal, she said: “The withdrawal agreement is virtually agreed. Chequers is about the future relationship. Brexit will give Britain the freedom to spend billions of pounds of more money on the country’s own priorities, including investing in the NHS, tackling the housing shortage and educating the next generation with the skills needed to get on. She added: “This is all about helping people along the way of that British dream. Mrs May was scathing about the People’s Vote and other well-funded campaign groups demanding a fresh national referendum on the Brexit decision. “When the referendum took place, we gave people the opportunity to make a choice. They made that choice. If we as politicians want people to trust us, then we have to deliver for them on that,” the Prime Minister said. “This was probably the biggest exercise in democracy in our country’s history. If we were to go back on that vote, it would destroy trust in politicians. “The parliamentary vote to give the choice to the people wasn’t a close run thing, a five to one or six to one vote to say to the public it’s your choice. Despite criticism of her Brexit plan agreed by the Cabinet at Chequers from both Brexiteer and pro-Brussels Tories, the Prime Minister insisted she was confident that a majority of MPs will back her hoped-for final deal in the Commons. 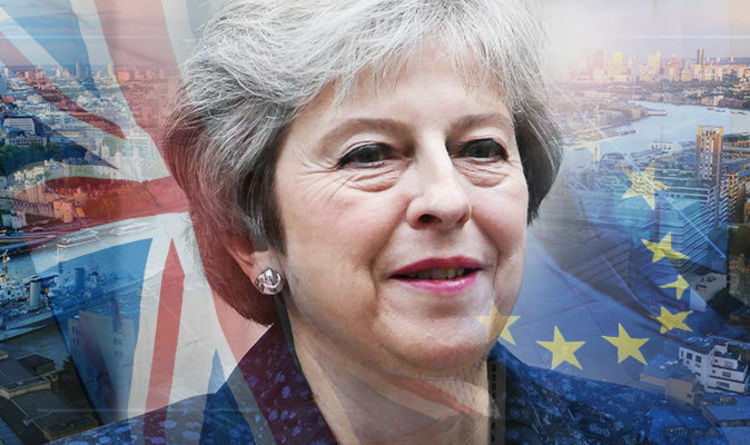 Looking towards Britain’s future outside the EU, the Prime Minister spoke of her passionate belief that Brexit can renew a sense of national pride across the country. “For a lot of people, they did feel that the UK would be making its own decisions again, that it wouldn’t be having that things decided in Brussels having to be done here in the UK. “What I sense from my trips around the world, Africa most recently, is that people are looking at us in a different light too because we will be that independent sovereign nation able to do our own trade deals. “As global Britain, people will look to us and the role we’ll be playing in the world. Mrs May was “confident” that the Brussels negotiations were edging towards a deal. She felt other EU leaders could see next year’s departure date looming and understood that a deal would benefit both sides. “I’m confident we can get a good deal. We’ve put the Chequers plan on the table and that does deliver for people. “I believe that what we’re proposing is the Brexit that delivers the freedoms that people voted for – making our own laws, controlling our own borders, controlling our money,” she said. “What I hear from other EU leaders is a recognition of that timetable and a recognition of the importance of showing we can sit down and come to an agreement. “I’m not going to be pushed away from doing what is necessary to get the right deal for Britain,” she said. Mrs May took a swipe at her Tory Eurosceptic critics including former Foreign Secretary Boris Johnson, accusing them of failing to produce a detailed alternative to her Brexit proposals. “The plan that is on the table to take us forward, the plan that delivers on the Brexit vote but also protects jobs and maintains the unity of the UK is the Chequers plan. I haven’t seen another plan that delivers on all of those,” she said. She firmly vowed not to compromise on the key issues that drove hundreds of thousands of Daily Express readers to vote Leave in the 2016 EU referendum. “What I am giving people a guarantee on is those areas that are non-negotiable for us – the key areas for people like Express readers who voted to Leave – that we leave, come out of the jurisdiction of the European Court, that we’re able to make our own laws, that we bring an end to free movement so we can decide who comes into the UK, no longer send vast sums of money to the EU so we can spend it on our own priorities like the NHS – those are the things people voted for and they are non-negotiable,” the Prime Minister said. She was also hopeful that Britons will come together and heal the Brexit rift once the country leaves. “I think people want to come together. For most people, they want Brexit done and they want to feel the country at last has come together,” she said. “As a nation, we’re at a really important point in our history. Brexit is that important point because our future is in our own hands.